In last month’s issue of “Am I covered for this”? we discussed how the home policy responds to frozen pipes. 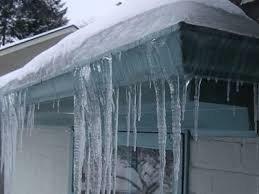 This month we will look at another one of old man winters problems- Ice dams on your roof. Who doesn’t like to see a 6’ icicle coming off a roof or downspout or several icicle’s coming off the home in some manner or another. Just be careful because these beauties can put your eye out, just ask Ralphie from A Christmas Story! All kidding aside what is happening and going on with your roof is heat escaping which causes the snow or ice to melt that is on the roof and then when the temperatures go down to 10 degrees during the night all this melting turns to ice. Unfortunately, this ice as it melts and turns into water can somehow get under your roof shingles and over the course of time can rot the wood under your shingles and could eventually cause a leak in your home. You will sometimes see stains on the ceiling where something like this happens. As you set out your pots and pans to catch these drips you may be asking yourself- “Am I covered for this”? The home policy is designed to cover the damage the water causes to your ceiling. The policy is not intended to cover the wood that becomes rotten, any shingles that become damaged, or the cost to get the ice dams off your roof. The home policy is not intended to be a maintenance contract. There are certain things we all need to do to maintain our homes. It is possible however that reasonable cost to prevent this from happening in the future may be covered by some insurance companies. If you experience a loss make sure to ask your Account Manager to see if they participate in such reimbursement. The home policy will also address that it is the insureds responsibility to prevent further damage to the home. In other words, you need to make sure you have proper insulation to prevent ice dams. You need to safely remove heavy snow from your roof so when it eventually melts will not cause ice dams. There are contractors that will do this safely for you at a reasonable cost, and again your policy may pay for some of this. Our agency and my family and I wish you all a very Merry Christmas and a wonderful New Year! !